Want to connect with My? Trusting some one else with your loved one can be difficult. Let us help! Let us make it easier for you. 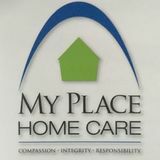 My Place Home Care operates with compassion, integrity and responsibility. We provide tailored care for your loved one to improve their quality of independent living. Each personal support worker goes through a personal interview with our clients, to ensure that a mutually beneficial relationship is created. All Personal Support Workers are trained in First Aid, CPR, full police record checks, certified and covered by our insurance. *For veterans: My Place Home Care is registered under Veterans Independence Program. Don't hesitate to reach out, your priority is our priority.